The Summer is quickly approaching and we want to help you make it a Summer to Remember! Residence Inn Marriott Amelia Island is now offering even more experiences for you and your family this summer! Weekend cookouts are back, oversized yard games have arrived, and the water is getting warmer every day, the time is now to book your family vacation at the Residence Inn Amelia Island. All new packages lead to all new adventures for everyone! Now offering packages for Kids, Adults, Explorers, the Easy-Goers, and everything in between we’ve got something for you. Captain Kid’s Adventure provides the ingredients for an exciting and educational getaway. From popsicles and beach toys to entry into Fort Clinch State Park to explore Historic Fort Clinch this package is perfect for the kiddos while on break. Our Best of Amelia allows you to take in the beauty of Amelia Island via bike with on-site bike rentals, explorer maps, and a treasured sharks tooth all in a cool back-pack. Looking to keep that beach bod all year? No problem! Check out our Wellness Package that includes a day pass to The Beat Fitness with over 15 classes to choose from as well as transportation and a cool bottle of water. As a special added bonus, each weekend you have the opportunity to join us for complimentary rejuvenating beach yoga with Regen Retreats. See below for more Amelia Island experiences. 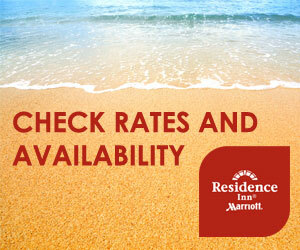 Discover the Residence Inn Marriott Amelia Island this Summer!